Orderhive is developed to fully support your business and offer everything you may need to grow. We provide dedicated support under all plans as we understand that without help, figuring out a new software can be a daunting task. There are three ways you can get in touch with our support team. 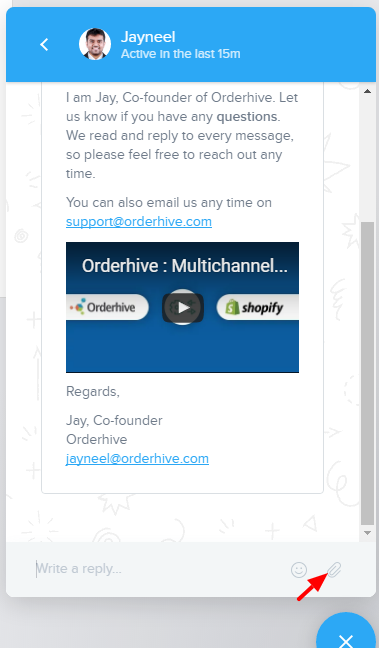 Every Orderhive account consists of a real-time chat window through which you can chat with our support agents or drop a quick message. To start chatting, click on the Message icon located at the bottom of the screen. If you're not able to get in touch with your account manager, any of our other experts will hop in and help you with any query or concern you may have. You can even attach files in the chat to send a quick screenshot to explain your queries/concerns or report an issue. This will make it easier for our tech team to come up with a solution at the earliest. Email is also one of the ways you can contact us. Simply send us your questions/concerns at support@orderhive.com. One of our agents will get back to you within 4-5 hours. We reply to every email that we receive and respond to them as quickly as possible. Skype is the most widely used platform to communicate in real-time. Considering how popular it is among business owners, we provide instant support via Skype. You can add us on Skype (ID: support.orderhive). In case you need answers urgently or want to report an issue, you can call us on +1-626-415-4150.